Halloween is one of my favourite times of the year, mainly because I love the colours but also because I love everything scary! 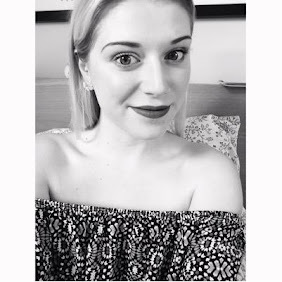 Horror films are my absolute favourites (I'm even writing my dissertation on them!) and also you get to dress up and come on who doesn't love dressing up! 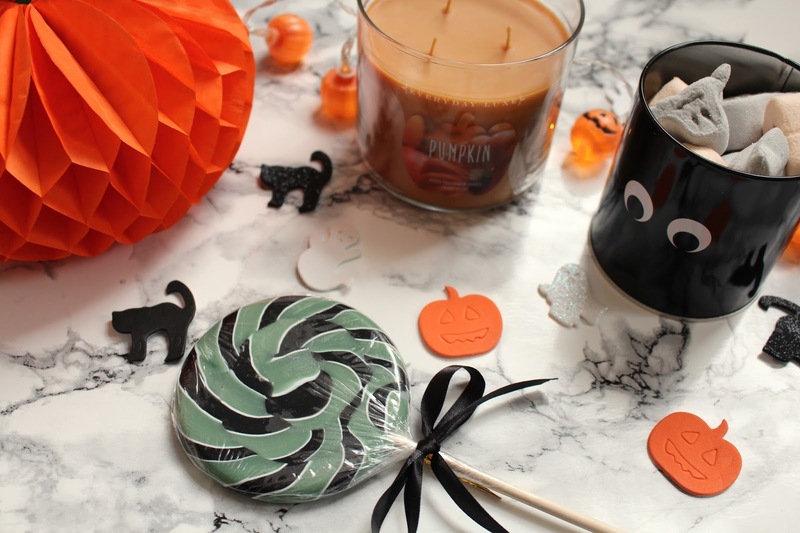 I have picked up some super adorable Halloween themed decorations and treats and wanted to show them to you guys because I just love them all! Firstly I went to TK Maxx and picked up this amazing candle. 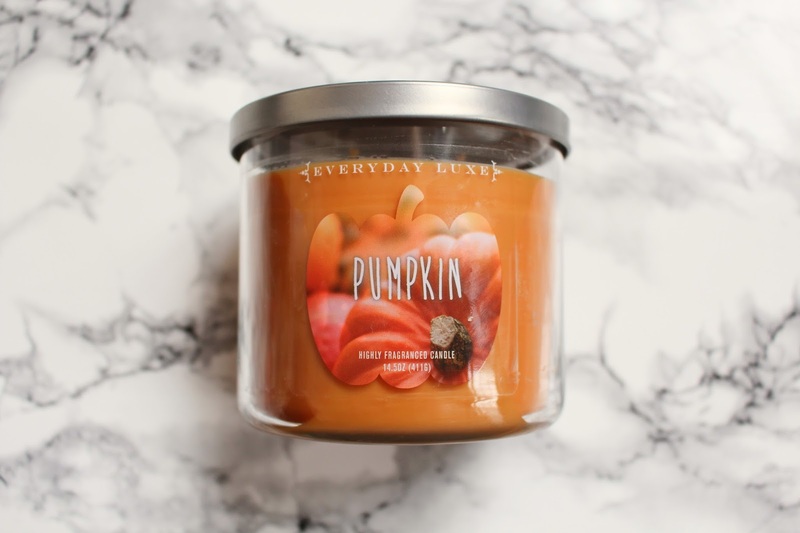 It is by the brand Everyday Luxe and is in the scent Pumpkin (obviously!). It smells exactly like a pumpkin spice biscuit, I cannot stop smelling it and I'm very excited to burn it. 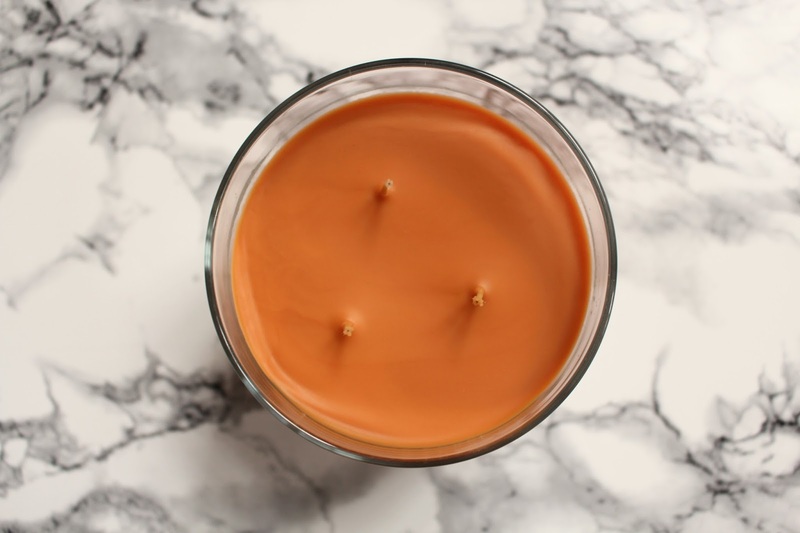 It is a 3 wick candle from the Harvest Collection, they also had white pumpkin which was just more of a pumpkin spice scent so I might have to pop back and pick that one up. I got this for £4.99 (bargain). Next I headed to Tiger and found some super cute items. 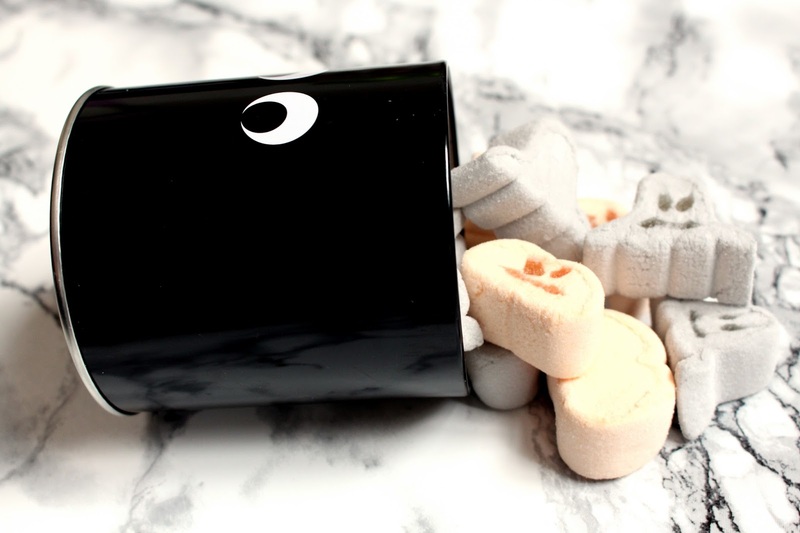 I got this super adorable black tin with ghost eyes on it which I am going to fill up with Halloween sweets and treats, but to put in it for now I picked up these yummy Halloween themed marshmallows which are ghost and pumpkin shapes, tasty and adorable! 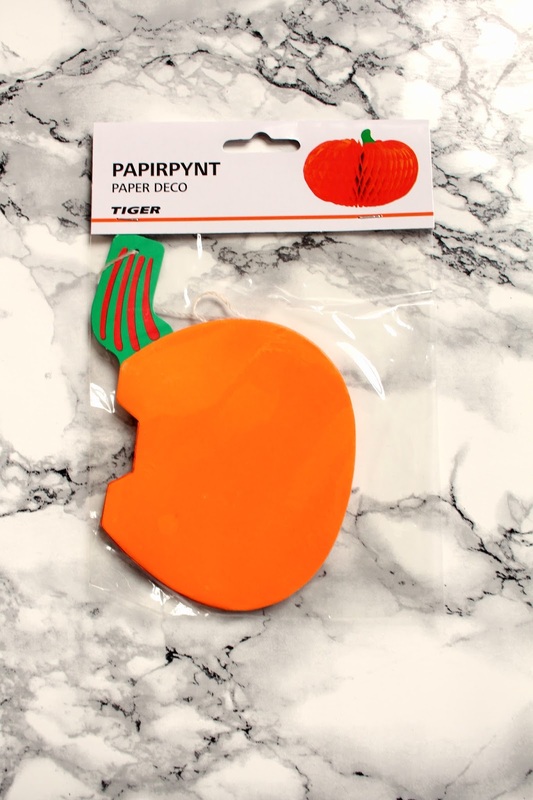 I then picked up a few little things, some battery powered pumpkin fairy lights, some ghost, black cat and pumpkin foam stickers and this fold out pumpkin which looks so funky I love it! Lastly I went to Wilko, the mother land of cheap decorations! There was SO much I could have bought but I had to restrain myself! I ended up getting 3 things, this really cute dinner menu plaque because I do love a good plaque! 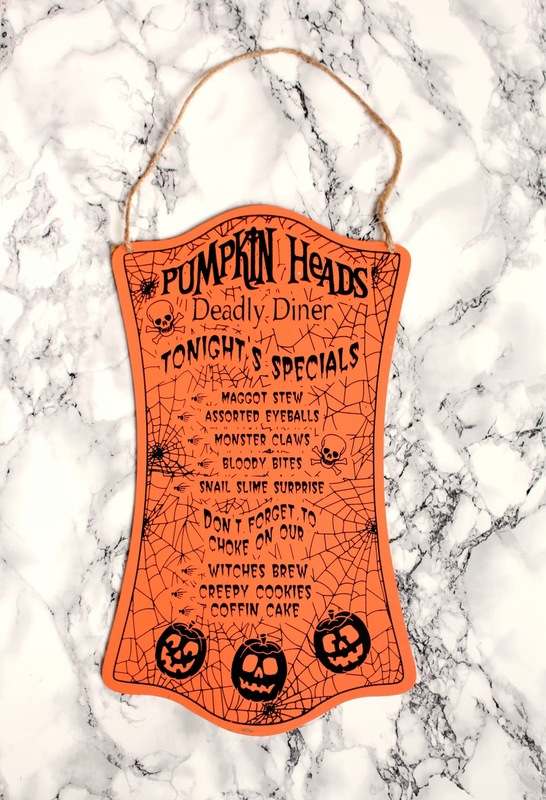 I love the food on the menu as well, especially the 'coffin cake' and 'bloody bites', I mean how bloody are we talking?! 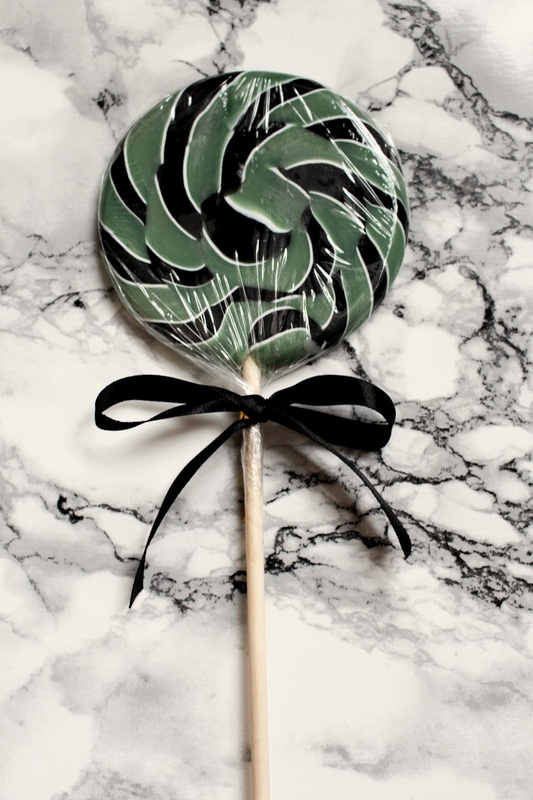 An apple flavoured green and black swirled lolly pop which I got because for some reason it reminded me of The Nightmare Before Christmas (don't ask why it just did haha). 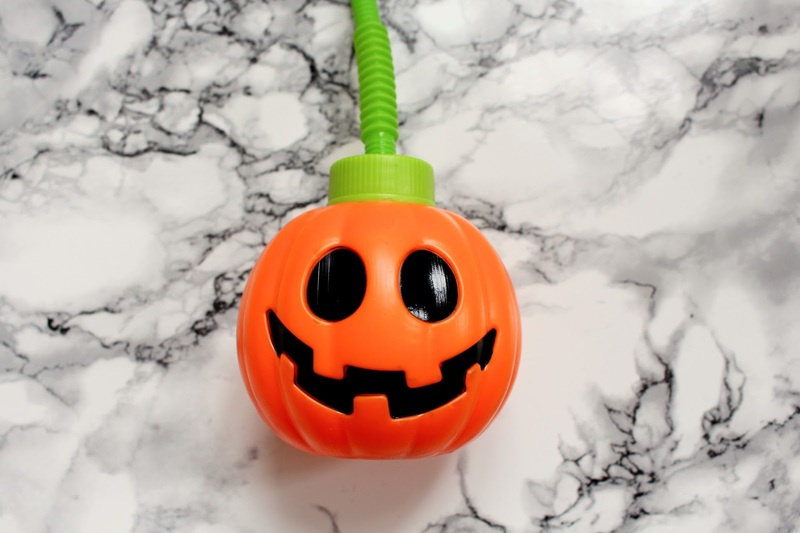 Finally my favourite purchase of the haul, A PUMPKIN SIPPY CUP!!!! I know its only small and obviously for children but I couldn't resist it, it was sat on the shelf saying 'Katy buy me, buy me or I'm going to be thrown out' and I mean for 50p HOW COULD I NOT!!!! God I'm such a little child at heart! Halloween is literally best! I want to go and get even more decorations for my bedroom now. You can expect a lot more Halloween themed posts coming up! 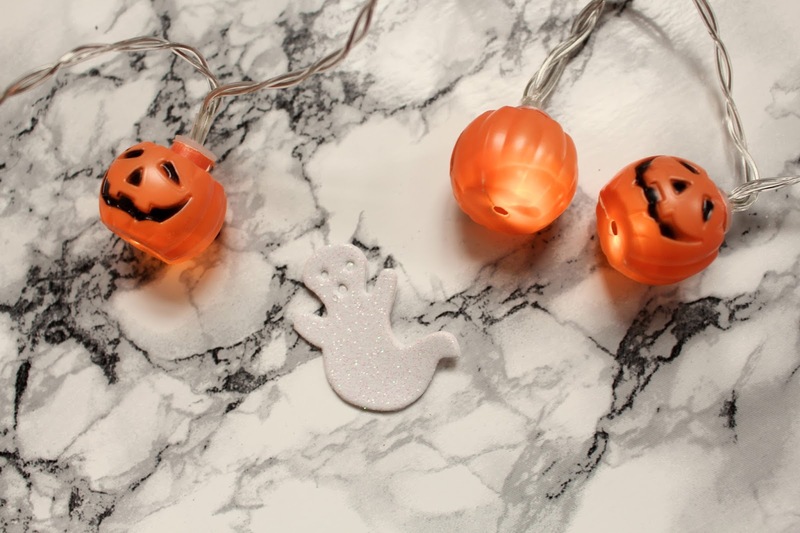 Do you enjoy Halloween?! Why/Why not? 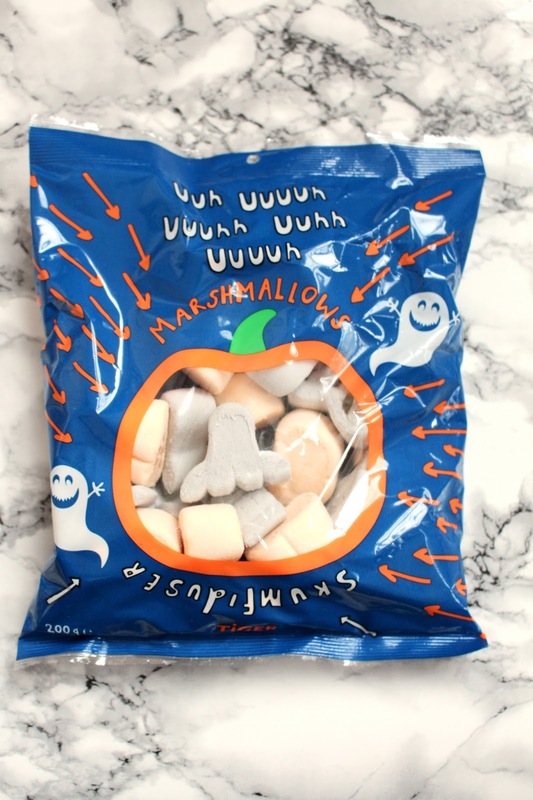 AHHHHH i've started buying Halloween bits for a haul/decoration post i'm doing next week. 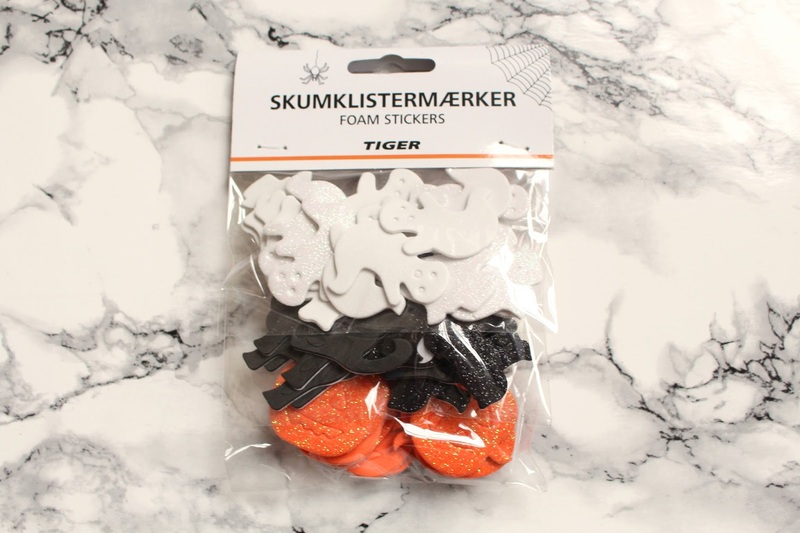 Tiger has some great stuff doesn't it, I'm SO EXCITED! 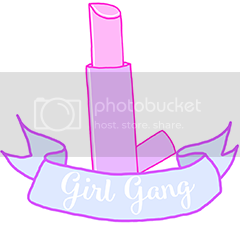 Aw, you got so many cute things! 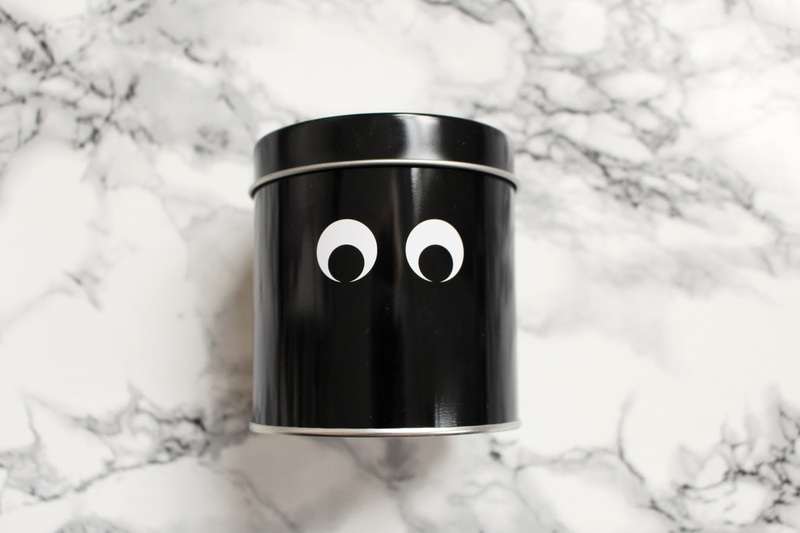 I love decorating in general, but Halloween is super fun! 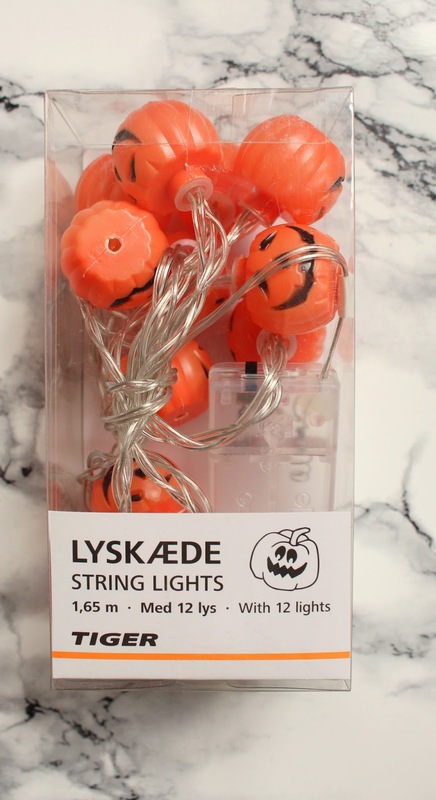 I love your little pumpkin lights!